$120.00 per licensed on-road motor vehicle. Vehicle decals are effective July 1st through June 30th and are renewed annually. Aircraft 12,500 lbs.-74,999 lbs. $1.35 per 1,000 lbs. of Max Gross TAKE-OFF Wt. Aircraft 75,000 lbs. or greater - $1.35 per 1,000 lbs. of Max Gross LANDING Wt. The FBO collects all fees on behalf of the airport authority. The purpose of this policy is to establish a standard procedure for the issuance of film permits that encourages the production of films in the Authority’s jurisdiction and establishes a structured process to control the issuance of permits. All commercial filming, including still photography and taping in the March Joint Powers Authority or March Inland Port Airport Authority requires a permit issued by the Authority. Most permits can be approved within five days of filing the application. Since processing certain applications may require the review of different departments, these applications may take longer depending upon the nature and extent of the project. Applicant 1. Obtains copies of Photography/Motion Picture Permit Application and Film Permit Policy from Film Coordinator. 2. Submit filming plans and if necessary, sets up appointment with the Film Coordinator to coordinate and review Film Permit plans and procedures. naming the March Joint Powers Authority as a coinsured for protection against claims of third persons for personal injuries, wrongful deaths and property damage before a permit is issued. b. Workers’ Compensation Insurance: An applicant shall conform to all applicable federal and State requirements for Workers’ Compensation for all persons operating under a permit. c. Performance Bond: To ensure clean up and restoration of the site, an applicant may be required to post a refundable faithful performance bond (amount to be determined) at the time application is submitted. Upon completion of filming and inspection of the site by the Authority, the bond may be returned to the applicant. Film Coordinator 6. Provides permission or denial for use of property. service fee. 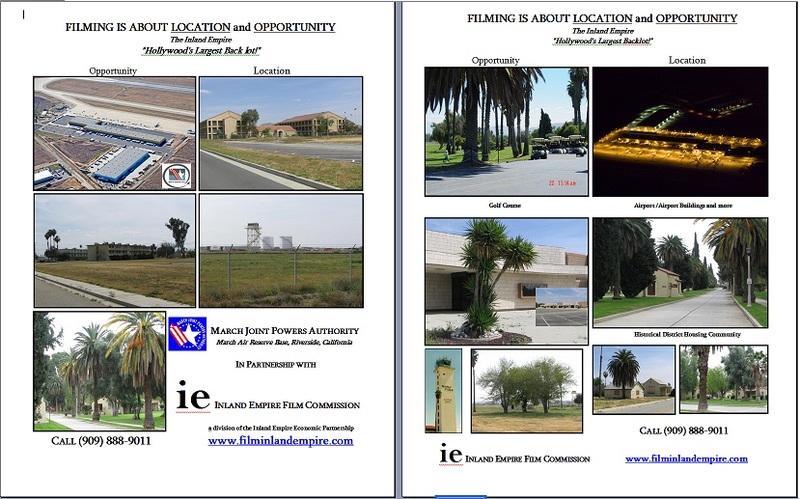 If filming is within public right of way, applicant is to obtain a permit from Planning. In addition, if lane or street closure is necessary, a traffic control plan must be submitted with permit application. Applicant 7. Pays service fee, to cover expenses of Authority for any personnel, equipment, and vehicle expenses incurred by the Authority to assist the film project. The fees will reflect actual costs to the Authority. Affected Departments 8. Submits to the Film Coordinator a completed APPLICATION with attachments for final approval. a. Written approval from applicable department. b. Evidence of insurance coverage. c. Copy of Business Tax Certificate, if required. Film Coordinator 10. Provides approval or denial of completed APPLICATION. 12. Pays filming fee of $1,400 per day or $700 per day if student. 13. Pays set up/tear down fee $700 per day or $350 per day if student. Film Coordinator 14. Issues Film Permit and if applicable Right of Entry. Applicant 15. Deposit Check guaranteeing payment of fees and charges in an amount equivalent to 120% of the estimated charges in the preliminary cost sheet. Please make checks payable to March Joint Powers Authority. Applicant must display or have in possession, on site, during filming the permit issued and supporting documents such as Right of Entry executed by the March Joint Powers Authority.